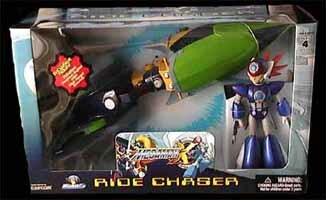 The Megaman 15th Anniversary: Ride Chaser with AXL is a pretty neat addition to the Megaman range. AXL, for those of you not in the know was first introduced as a playable character in Megaman X 7. I found the marketing of this product a little odd. 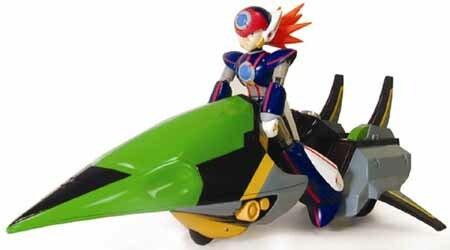 Instead of being released as AXL with bike (as most products would be for licensed characters) this seems to be the bike plus AXL. While I know the bike is the biggest item in the box, fans of the series will be more interested in what figure it comes with than the actual vehicle. Incidentally, AXL is not available as a stand alone figure, you'll have to buy this set if you want to own it. But, as the bike's so cool, I doubt that will be much of a problem for fans of the games. The AXL figure has numerous points of articulation - neck, shoulders, elbows, wrists, waist, hips, knees and ankles all have ball and socket joints. This helps the AXL figure to pose in any number of position. And it comes complete with two pistols. The bike is huge (14" in length) and looks fantastic. It has a friction powered engine with high speed sound. What this means is that it uses that age old battery free method of allowing the bike to travel further distances when you push it. The "high speed sound" actually sounds pretty effective when you consider that it's not electrically produced. As a package, this product is fantastic. Well designed, beautifully detailed, and pretty cheap... Megaman fans will lap this up! Other stockist of this item include: Argos and all good toyshops.